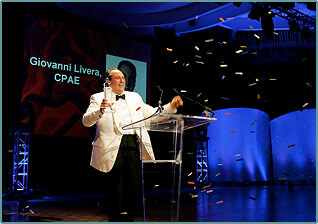 Local Winter Park Resident Giovanni Livera Reaches Second HALL OF FAME Status in Two Separate Careers! reach that particular status and is normally voted on by the peers in their industry. And here in Orlando, we have an extraordinary person who has reached the Hall of Fame award in two completely different careers! And this past Monday night, August 4, at an awards banquet in front of several thousand attendees of the National Speakers Association convention in NYC, Winter Park Resident Giovanni Livera accepted the Speakers Hall of Fame Award for excellence in speaking. In a totally separate career in 1991- Livera received the Gold Cup for Excellence in the Art of Magic by the International Brotherhood of Magicians. and Backpack Basketball that entertained the crowds during half time here and around the world. Never to be at a stand still, Giovanni has been incorporating his passionate messages of inspiration into his astonishing performances since 1992. 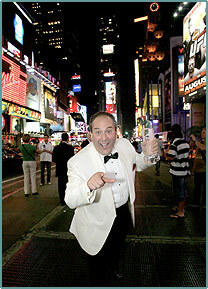 He has since traveled the globe to become one of the top corporate motivational performers in the world. He has presented to over half of the Fortune 500 companies. Giovanni is the founder of TimeCompass, a innovational first of its kind personal and professional development center in Winter Springs FL. He is the author of three books including his latest work, “Live a Thousand Years, Have the Time of Your Life”, which is now a inspirational seller.